Abstract : Explains how to sample the transferfunction of a discrete linear time invariant filter. How an enveloped tone can be used to sample the groupdelay, frequency response and phase response of any linear time invariant system. This is useful to double check analytical solutions of filters as well as calcualte frequency responses for finite impulse response filters. When dealing with digital filters it is often useful to understand the filter in greater detail. That means knowing the frequency response, phase delay and group delays. In short, the transfer function. Given a frequency annotated with z and its presence in an input signal X, then the output of the filter, for that frequency, can be written as Y. Because z represents a complex oscillation, the transfer function defines both the gain (which is , or when decibels are required), and the phase modification, which is . For many IIR filters (biquads, butterworths, chebyshevs, bessel filters, ...) analytic solutions exist. For arbitrary FIR filters, given by the coefficients c_0...c_n, it suffices to calculate the Fourier transform of the coefficients. Each bin will then provide the phase response and the frequency response of the respective frequency. The problem is that the information 'between' the bins is lost and cannot be easily interpolated. So, we would, for instance, know the responses at 20 Hz, 40 Hz, 60 Hz, but nothing in between, which is often too inadequate. Of course, one must give the filter some time to adapt and detect the frequencies. Therefore it should be primed with e.g 4096 samples before measuring the frequency response. The advantage of sampling the transfer function with such a pair of waves is that we can measure 'between the bins' and that it works for any linear time invariant filter, without needing analytic solutions (not that they are bad, but it helps to have a secondary system to test whether they are correct). which is a problem to calculate because we don't have a 'differential' that we can sample. The easiest solution would be to sample two consecutive phase responses, subtract them and divide by the angular difference. This approach leads to unsatisfactory results because off rounding errors, and the resulting groupdelay oscilates strongly in the high frequency range. There is luckily another method to find the group delay. Another definition of the group delay is how much the envelope is delayed. This is something we can measure by putting into the system a wave with increasing envelope and then measuring when that envelope comes out of the system again. Below we explain how both the group delay and frequency response can be obtained from such an envelope increasing pulse. in which l is the length of the block we will put into the system. Sampling the transfer function with an enveloped tone. 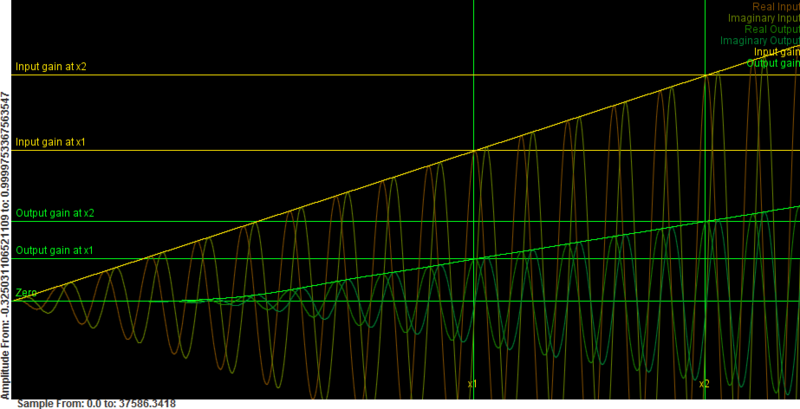 The yellow signals are the real, imaginary and amplitudes of the inputs. The greenish signals are the real, imaginary and amplitudes of the output. The figure illustrates these 6 functions (real input, real output, imaginary input, imaginary output, input amplitude and output amplitude). The phase delay can still be measured as before. However, the frequency response can no longer be simply obtained as a division of o(x)/i(x). That is because the output amplitude will come out of the system delayed, and we would effectively be dividing an output amplitude from the past with an amplitude 'now'. However, we also don't know the group delay (yet). Luckily, groupdelay and frequency response are two distinct features off the envelope, and we can use this one sampling to obtain both at the same time. which is the group delay in samples. which might be somewhat of a problem because the group delay might not be an integer. Another strategy is to interpolate between two points, which, if extended, leads to a division of the two direction coefficients of both lines. The phase response can be measured in exactly the same manner as before. When the gain of the filter is 0, calculating the group delay or phase responses is difficult. Nevertheless, in those instances, they don't matter because the gain is 0 anyway. At very low gains, round off errors might occur. Frequency response of a simple biquad filter.